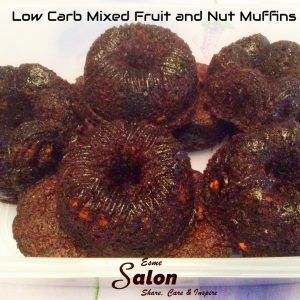 Looking for a healthy muffin to start off your day, then you have to try these Low Carb Mixed Fruit and Nut Muffins. In a large bowl, combine the apple, eggs, oil, syrup, stevia, and milk together. Set aside and let the batter to sit for 5 minutes. Now add and the fruit and nuts and lightly mix through. Scoop a 1/3 measuring cup full into each greased muffin tin. It should be at least 2/3 full and bake at 200C (375F) until the tops are firm to the touch, ± 15-20 minutes. I made 8 large cupcake size and 6 small bund size muffins, and they’re decent size muffins. Should you prefer smaller ones, feel free to divide the dough and spoon each muffin well approximately 2/3 full. Let them cool down, then turn them onto a cooling wire tray. Store in an airtight container in the fridge and enjoy for breakfast. These sound tasty and not too calorific too! Thanks, Rachael – you can substitute the maple syrup with anything else you prefer, but that’s what I had so used it, and although I say so myself, they came out very yummy indeed. This is the kind of muffin I need for me and my hubby. Thank you,Esma!